"Hi - this is your mother." "I am sorry: you must have the wrong number. Again, this woman insisted she was my mother, but never specifically asked for anyone by name. Politely, I ended our call. 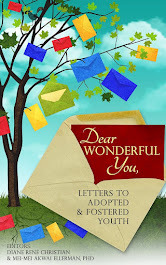 At the time, it never crossed my mind that the woman on the telephone might have been the woman who had placed me for adoption at birth"
As a contributor to this book myself, I feel honored to have taken part in this project. I was reading through the list of contributing authors and was shocked to realize that I know each one of them through on-line friendships or from reading their blogs or other writings. 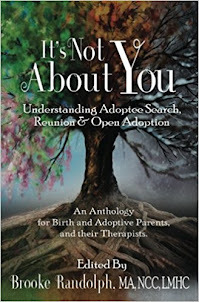 It seems the adoption community is getting both larger and smaller at the same time and I have hope that with this book and others like it that the adoptee voice and perspective will be getting more consideration in the adoption world. Today I am interviewing JoAnne Bennett about her amazing story in this book. Lynn: Good morning, JoAnne! I am excited to do this interview at the suggestion of our hilarious and amazing editor and fellow author, Laura Dennis. She makes adoption so much fun to talk about! I have a few questions for you so let's get started. 1. JoAnne, you mention finding your maternal birth family and learn of a buried secret -- did you feel a close connection with your maternal side? JoAnne: My oldest sister was 14 when I was born. My brother was 12, and my younger sister only 8 years old. The two oldest said that their father had shared with them while on a camping trip as young adults that their mother had placed two babies for adoption. I also have a close-in-age younger brother that was placed in a separate adoptive home from me. Our mother had already passed away when that camping trip occurred. I believe the timing had something to do with my adoptive mother because she would have just been remarried. My only birth certificate still had both my sibling’s father and my birth mother’s name on it. At first, one might think that it was just a simple error -- perhaps my original birth certificate had never been replaced with the amended one with my adoptive parents' names. But even with my second "adoptive" father's extensive money, my parents couldn't fix the issues with my so-called "missing" amended birth certificate because it was a bogus adoption. I sense my sibling’s father was worried back at that time that my adoptive mother, or her lawyer, wouldn’t stop at just contacting him to try to figure out a way to straighten up the mess with my birth certificate, and his older children would somehow find out, too. It’s only speculation on my part, but I am sure I am not far off from the truth. My two oldest siblings hadn’t spoken to each other in many years when I contacted them. If anything good came from disrupting their lives it is that they had to be somewhat civil to each other :). At times, it felt like I had to take sides in order to fit in because there seemed to be a power struggle going on with the two oldest siblings. Having not grown up with them and being a lot younger, I had no idea how to handle the often uncomfortable situations. My relationships with each of my three-siblings were short-lived, but although I felt a sense of rejection, I was relieved at the same time. I had too much on my plate at that time and I couldn’t tell anyone what I desired or needed. 2. You don't mention your birth father in your essay. As an adoptee still seeking my own birth father I am curious -- can you share the circumstances or your thoughts on him? JoAnne: I've had 4 absentee fathers throughout my life. 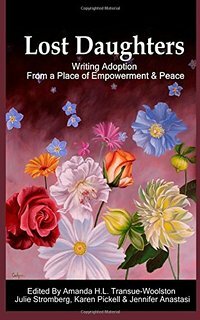 I never saw my first adoptive father again after my parent's bitter divorce when I was the tender age of 6, a marriage and divorce that had been fueled by his alcoholism. Adoptive father #2 led me to believe he had adopted me at a young age, but then sprung it on me when I was 32 that he never had. With no honest explanation, he asked to adopt me at that time. When I asked him to tell me the truth to the many lies and secrets, his only answer was—I thought my inheritance would be more important than the truth. I chose to walk away knowing I had lost what was most important to me, a father's love. The courts confirmed the fact that he still never adopted me. And when I met my birth siblings for the first time and one said, "You do know the man on your birth certificate is not your father, but just ours?" I was caught off guard. He would be considered father #3 by law, but only on paper. I was conceived during my mother's marriage to him, but regardless of what the birth certificate said, he was not my biological father. To get to your question, I was determined to find my birth father (father #4), but sadly, I learned he was deceased. Because his identity has always only been small town rumors and gossip, I’ve been trying to connect the dots with fascinating, but frustrating DNA tests. I am determined that one of these days I will have my family tree. All my fathers had passed away before setting my heart straight. 3. 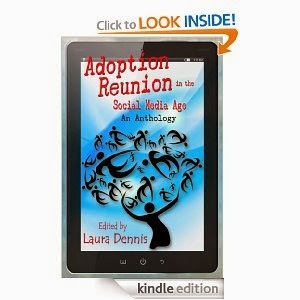 You mention kind strangers who helped you along the way in your adoption search. Can you share more about these kind strangers? JoAnne: A 95-year-old man called me long distance and said that he had his wife dial my phone number because he was blind. He just wanted me to know that he and wife were praying for me after receiving my letter inquiring if he happened to know the identity of my birth father. How many of us can say we have the real-deal, genuine clown friend? I've never even been to a circus :). Robert (clown friend) and I met when I was searching for my birth father. As it turns out, his late father had been best friends with my younger birth brother's biological father, the mayor of the town. I had no plans to find my brother’s father. I thought because my brother and I were so close in age, we would have the same father. Well, my new "clown" friend Robert was adopted, too. Interestingly, I was conceived in the small town where he was born and placed for adoption, and he was conceived in the "big city" where I was born and placed for adoption. We instantly became good friends. He had no desire to search, but made it clear he would be there for me. He helped me by getting names and addresses for all the old-timers from the small town that might have had some recollection of who might be my father. He is one of many wonderful friends I've made in my journey. Robert is a clown for Shriner's Hospital and once a year he sees my oldest birth sister and her husband at a charity function. They also knew each other from school. It's our secret that he and I are friends, but he shared some helpful insight for me to ponder. Even when he sees my birth sister while he is dressed up as a clown, she is still a very unhappy woman with never even a hint of a smile. He reminded me more than once not too be so hard on myself, that he was sure I had given our sisterly relationship my best shot. On a side note, one evening I received a phone call from Robert. He said that he had been at this party with a lot of friends from his hometown. "Your ears must have been burning," he laughed. Apparently, I came up in the conversation with the guests. 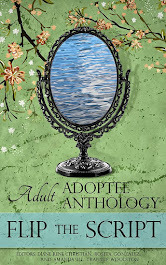 I was the young mystery woman looking for her birth father. Some wondered where I got their addresses. Of course, he sat there very quietly just listening. He said it became quite a debate in trying to put themselves in my shoes, and why would I make myself so vulnerable verses just leaving it alone. For the most part, those at the party considered me brave and daring. But then again some were critical about why would I do this if it might hurt my birth siblings. In my letter, I had made it clear that my intentions were to never hurt my birth family, and out of respect for their feelings to please not involve them in this personal matter. None of them have lived in that area for many years. I know now, no matter how I would have gone about searching for my birth father, there would have been negativity from some individuals with different mind-sets. Lynn: I like the advice you give to adoptive parents in your essay, JoAnne. 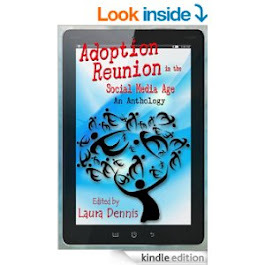 . . that was a great idea because my experience of adoptive parents these days are parents who want to know better how to guide and raise this generation of adoptees. 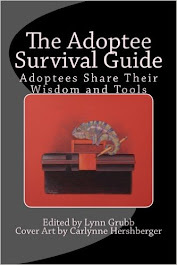 It is my hope through this anthology and others like it, we will provide the tools to accomplish just that and one day, adoption mythology will be a thing of the past and the issues we adopted people face will be textbook knowledge and will be part of adoption certification and therapist education of the future. 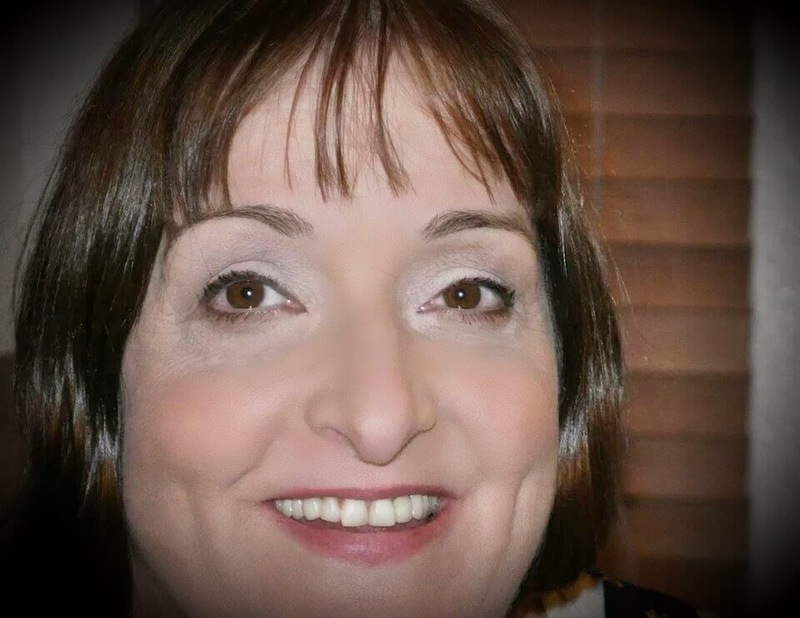 Visit JoAnne at her blog. Thanks to JoAnne for letting non-adopted people like me take a peek into the dynamics of secrets, lies, and managing others' insecurities while trying to find your own Truth. She could teach all those Truth-thwarters a thing or two about grace and kindness. Thanks Lynn and JoAnne for this interview. Strength to see it to it's (seeming) never-end.